It is replaced by the Honeywell 3800i. Industrial linear imager Keyboard wedge kit: Scanner, PS/2 Y-cable, & user's guide. Industrial linear imager with Keyboard wedge, USB & RS-232 interfaces. Includes user's guide. Order cables separately. See accessories. 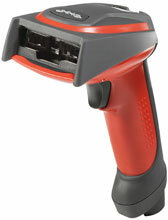 Industrial linear imager USB kit: Scanner, USB cable, & user's guide. RS-232 TTL, black, coiled, 2.3m (7.7'), power from PS/2 keyboard/mouse port. Non-Cancelable/Non-Returnable.